So, something a bit different this time, I’m reviewing the entire food and wine experience at a restaurant called Bodega, a Tapas bar on Commonwealth Street in Surry Hills Sydney. Before I start I would like to apologise to my Sydney friends, yes I was in Sydney last weekend but it was a very short visit, less than 26 hours. Having dined at Porteno, Bodega’s sister restaurant, last year we were keen to try Bodega, so much so that we thought we’d get there early to guarantee a seat. Apparently 7 o’clock in the evening is not early enough and the place was packed! We returned half an hour later after receiving a call to say a seat was ready for us. Once inside we were greeted by that harmonious hum of diners enjoying their meals and each others company, sizzling pans and the crack of beads against a hanging gourd, the notification that a dish was ready to be served. We were told we had the best seats in the house, which I admit they were. Seated at the bar we were looking into the kitchen watching the chef’s show off their amazing finesse. To start with I ordered a very good Fino Sherry (score below), Fino Sherry is made from the Palomino grape. It is made by aging in a barrel that is not quite full normally a wine would oxidize from this however for Fino Sherry a yeast called Flor yeast is added and forms a crust over the wine after all the sugar has been fermented from the juice. Flor yeast can then kick into another metabolic phase in which they use alcohol and oxygen to form a crust and produce Acetaldehyde. Mmm, crusty yeast. My partner Brittany had a Verdejo, or Verdelho as we know it in Australia,from Rueda, Spain. The sherry went perfectly with the first two dishes, spiced calamari with aioli, perfectly cooked, and mushrooms in garlic sauce. The calamari set expectations high; the paprika/seafood combination was interesting and, to my surprise, complimented the dish excellently. The food came out quickly which was to be expected when watching how efficient the chefs’ were. 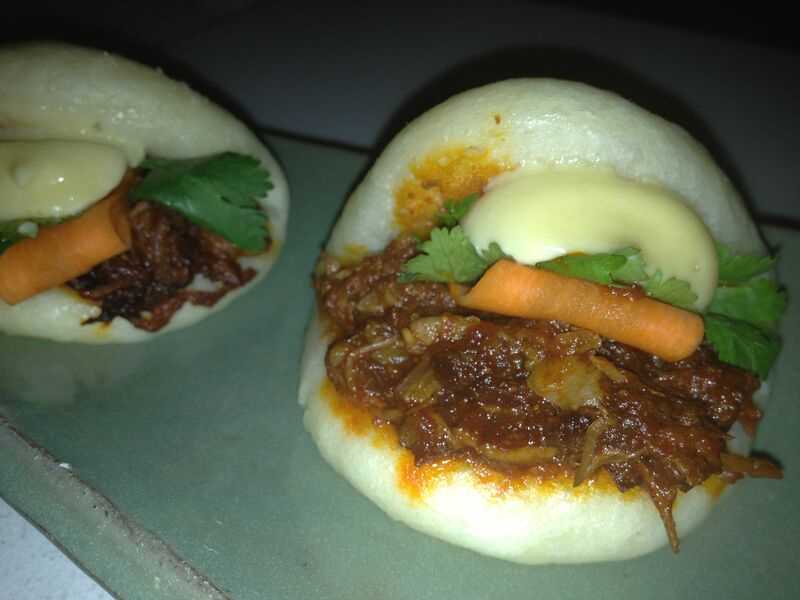 Next to arrive were the steamed buns stuffed with spiced, pulled pork, pickled carrots and miso mayonnaise. These little suckers were packed full of flavour, coconut, spice and miso. The flavour interactions were great. Alongside the pork we had slow cooked lamb ribs with salsa verde on an eggplant purée. The ribs were light and full of fresh flavours, not what I was expecting, which was rich, sticky ribs it was a refreshing style of a dish that can be quite heavy and fatty. With these two dishes a Rioja Crianza, I’m fairly certain it was predominantly Tempranillo, was enjoyed. Crianza means that it cannot be release for sale until it is at least three years old and that it has spent at least six months on oak. The spice of this wine went really well with the pork and the tannin structure matched the lamb ribs perfectly. To finish Brittany had White-chocolate and macadamia cookies with vanilla bean ice-cream and crushed aero bar. From all accounts it was delicious. I’m more of a dessert wine man than a dessert man so I went for the 30 year old Pedro Ximenez. I’ll let you in on a secret, if you ever offend me, anger me, cut me off in traffic or get on my wrong side all will be forgiven if you buy me a bottle of Pedro Ximenez. Pedro Ximenez is a white grape grown for its ability to produce high concentrations of sugar. When left to wither in the sun (which removes even more water and leaves only sweet, sweet goodness) and fortified it produces a rich wine with terrific aging potential. It is often used for sweetening Sherry. 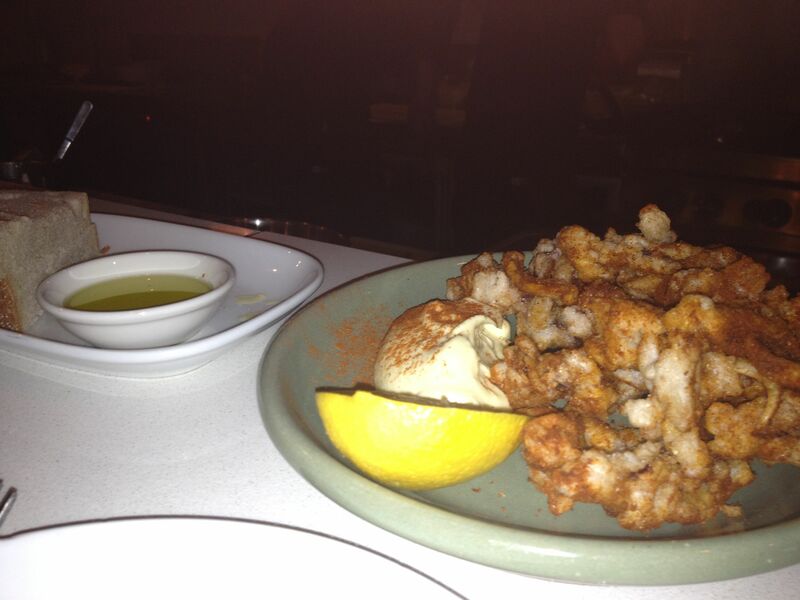 Overall the food was incredibly enjoyable and very reasonably priced. I would go back there in a heartbeat. Great staff and delicious food. 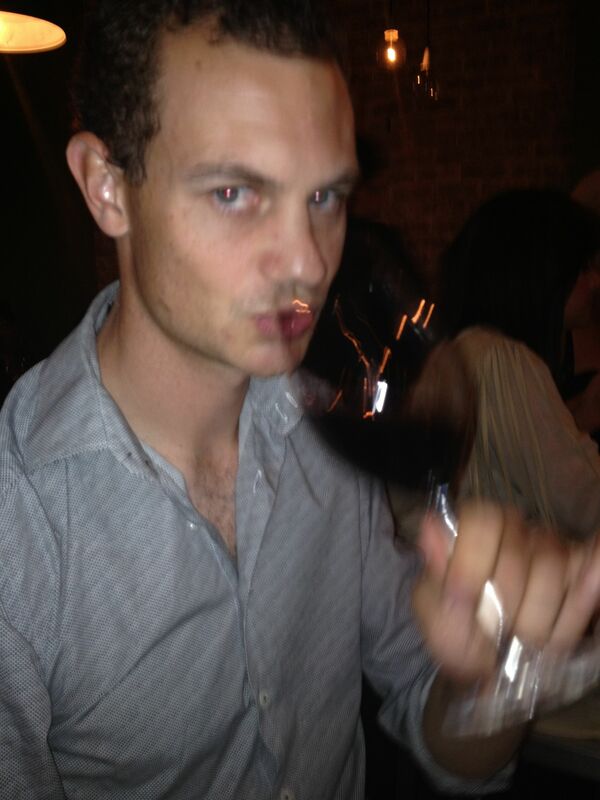 The wine was great; I love a restaurant that caters for my love of international wines. Tasting notes: Now for the tasting notes, hastily jotted down on the night. Noe Pedro Ximenez 30 year old: Inky colour. Coffee and caramel on the nose. Youthful muscat fruit on the palate, coffee, cinnamon, lingering spice. A smooth finish. Score 19/20. Overall experience: 19/20 Great stuff guys! Overview: I have found that Pinot Noir is one of those varieties that people either love or hate. I’m a self confessed Pinophile, I love the grape but I do understand why people struggle with it and I think I know why- Pinot Noir’s nose and palate is often described with words like gamey, forest floor and barnyard. To someone who isn’t used to the flavours of Pinot Noir this sounds like the scent of an above ground grave in a forest right? So I wanted to find a Pinot Noir which does not display these characters so people who haven’t been able to get their heads around Pinot Noir. Its strange, we have a very grumpy, naughty rabbit named Freddie Mercury that lives with us, he smells of game, barnyard and forest floor (due to the straw in his lavish cage) but I have no desire to sit down and sniff at him like I can a good Pinot Noir. The Cosmo Pinot Noir, I must resist the urge to call it Cosmo Kramer Pinot Noir, shows the fruit characters of Pinot Noir and leaves out the strange stuff. Tasting Note: Vibrant ruby in colour. A nose of maraschino cherries and strawberry, these flavours continue onto the palate and are joined by characters of pepper and menthol and a cleansing acid. It is lighter in body and matches perfectly with lighter red meats and pork. It sells for between $15 and $20. Final Say: This is a great Pinot Noir to help you appreciate the variety and if you’re a Pinophile like me it’s refreshing to find a great Pinot at a reasonable price. Score: 16.5 Give it a try, it’s a great drop (83 out of 100). Tasting Note: The initial character I picked up on the nose was orange sherbet, this follows through to the palate and is joined by flavours of green apple, clean minerality, lime juice and a lingering saltiness. Yes, saltiness, chloride can be found in grapes. It finishes with a lovely, linear acidity. Final Say: I have to say, I was intrigued by this wine and have been chomping at the bit to try it. It lives up to the hype however I did find the saltiness interesting. Australian Rieslings in particular tend to have a higher chloride component to the grape which has found them often criticized by lovers of international Rieslings. I find the saltiness adds another mouth watering sensation to the wine. There is a touch of residual sugar in this wine but nowhere as near as sweet as a Kabinett Riesling. I picked mine up for $45 a bottle and it’s a perfect match with pork. Overview: This week I’ve tried something a little different, over two nights, with the same meal I’ve tried an Italian Primitivo and an Australian Zinfandel. What’s the difference between Primitivo and Zinfandel? Well nothing, they are both the same variety so why the different names? Well it’s a little like calling corn ‘corn’ in Australia and calling corn ‘maize’ in America. In Italy they call the variety ‘Primivito’ and in California they call it ‘Zinfandel’ and true to the Australian way we grow it, produce it and call it both depending on what the winemaker thinks may sound more romantic. How romantic can you get? Primitivo sounds like a new model of Volkswagen and Zinfandel sounds like some hideous war crime. Any way, I digress, I tasted the A-Mano Primitivo 2008 IGT and the Elderton Estate Zinfandel 2009 and while both were similar they were time very different at the same time, not only because one comes from Puglia, Italy and the other from the Barossa Valley but because of the very nature of the grape itself. 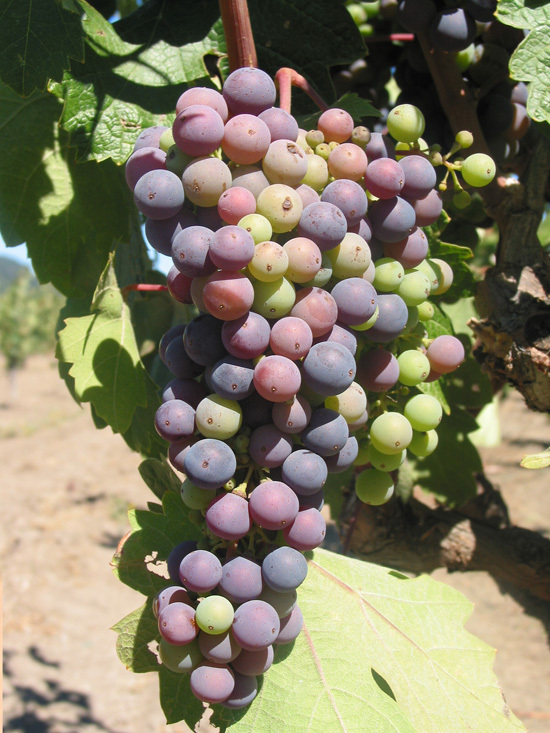 To avoid confusion the variety will be referred to, from here onwards, as Zimitivodel, not a registered synonym for the grape but give it time… Zimitivodel is a grape that grow in large bunches, the bunch ripens unevenly which means you can have very ripe berries mixed with green berries on the same bunch. Thus you can hand pick the grapes at the sugar level you want – disregarding the unripe grapes, or you can patiently wait for the whole bunch to ripen which means higher sugar levels which translates into higher alcohol content and very concentrated fruit. A- Mano (13.5% Alc) is an example of the first way of handling the grape and the Elderton (16% Alc) the second way of cultivating the variety. A-Mano Primitivo 2009: Vibrant ruby in colour. The nose is of white pepper, cherry and strawberry, these characters follow on to the palate complimented by sandalwood and aniseed and soft tannins. Elderton Zinfandel 2009: A nose of sour cherry, pepper and cinnamon. Initially on the palate there is a punch in the face of strawberry and game but a richness lingers. Chocolate and persistent acid on the finish. Final Say: So what was the result? Well both were similar in their primary fruit characters the main difference was the spice. Both wines were a touch short on the back palate, which suggests to me that a small amount of another variety should be blended in to fill that black hole. My preference is with the Italian Zimitivodel, I found that the wine developed a great aniseed character as it opened up which was very seductive. Both wines were tried with a Moroccan Lamb Casserole, a great food match.